We all get one day a year to call our own. Send Happy Birthday wishes with a speech bubble or word board so that they know you're thinking about them on their special day, even if you are just thinking about your next drink! 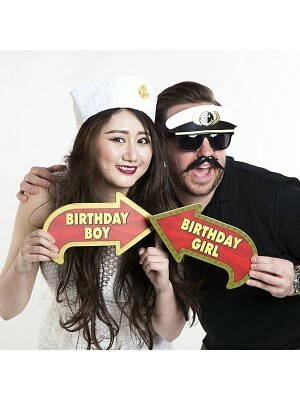 Here we bring you some of our great birthday props in a multi-pack version just for photo booths. DISPATCH: We have all products in stock and we usually deliver your order within 1-2 working days. Orders placed on a Friday after 2.45pm, and over the weekend, are despatched on the Monday. All orders Mon-Fri, before 2.45pm, will be dispatched the same day. Orders made after this time will be dispatched the very next working day. All shipping costs will be displayed during checkout process. Orders over 2kg for Scottish Islands, Scottish Highlands, Channel Isles, Isle of Man, Isle of Wight, Scilly Isles will be sent by courier service. *Free delivery for all UK orders under 2kg. *For orders over 2kg, free delivery does not apply for the following areas and orders will need to be sent by courier, Northern Ireland, Scottish Islands, Scottish Highlands, Channel Isles, Isle of Man, Isle of Wight, Scilly Isles, Guernsey, Jersey, Channel Islands, Isle of Man, Isle of Wight. There is no Next day delivery for the following areas and orders will need to be sent by courier, Northern Ireland, Scottish Islands, Scottish Highlands, Channel Isles, Isle of Man, Isle of Wight, Scilly Isles, Guernsey, Jersey, Channel Islands, Isle of Man, Isle of Wight. All next day courier deliveries are a fully tracked service with customer SMS and email notifications advising them of when their parcel will be delivered, and on the actual day of delivery a one hour time slot. Please make arrangements to receive this delivery. It is also possible for a customer to get a notification when they are next in line for their delivery slot if this is requested in the morning when they receive notification of their hour time slot. A customer also has the opportunity to change the day of delivery at this point. If the courier is running late, possibly due to unforeseen heavy traffic or an accident, they would also get a notification informing them that the driver will be late. It is a good idea to use an address where the delivery can be accepted. If the delivery attempt is unsuccessful we will make one more attempt to deliver. If this attempt is unsuccessful the parcel will be returned and there would be further delivery costs if the parcel were to be sent again. The following areas are eligible for free shipping on orders over £50 and under 2kg only, Northern Ireland, Scottish Islands, Scottish Highlands, Channel Isles, Isle of Man, Isle of Wight, Scilly Isles, Guernsey, Jersey, Channel Islands, Isle of Man, Isle of Wight. These areas are not eligible for next day delivery. International Orders are despatched by our courier and take around 2-10 days to deliver depending on destination country. Contact us by phone first to arrange shipping costs. Please make arrangements to receive your order. If you miss the delivery you will have to collect the parcel from the delivery office. If the parcel cannot be delivered, the carrier will return it back to Photobooth Props Ltd. We will have to charge additional fees for the return of the parcel.